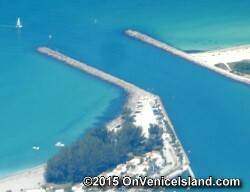 Humphris Park is the entrance to the area commonly known as the Venice Jetties. Venice Beach is located at the west end of Venice Avenue one mile west of business Route 41. If you're a SCUBA diver, a reef containing fossilized material is located a quarter of a mile offshore. You can also find fossilized sharks teeth along the beach. Venice Beach is is certified as a "Blue Wave" beach by the Clean Beaches Coalition. Maxine Barritt Park offers parking and beach access. There are restrooms, picnic shelters and the park is just south of the Venice Fishing Pier. There are no lifeguards on duty. Brohard Park is located in the southern most part of the City of Venice, on the Venice Airport property on Harbor Drive. If you enjoy fishing, there's a 740 foot fishing pier on the property for public use. The pier has rest rooms, a snack bar, and a bait shop. Also located at the park is Sharky's Restaurant and the U.S. Coast Guard Training Center. The wetland area is known for bird watching. There are no lifeguards on duty. The Venice City Commission voted to allow dogs at South Brohard Park. There is a fenced area, a dune walkover, a drinking fountain and showers for dogs and fire hydrants and leash posts. A 300 foot section of beach is a dog beach for dogs and their owners. Dogs must be on leash or under voice control. Owners must clean up after their pets. Caspersen Beach is located south of the Venice Airport on Harbor Drive. Two thirds of the the beachfront has been left in its natural state, offering a very secluded location. Caspersen is known as a great place for collecting shells. It's also the best beach for finding pre-historic sharks' teeth like the dime size one pictured here. Caspersen beach is about 4 miles long and you can walk all the way down to Manasota Key. Caspersen Beach is is certified as a "Blue Wave" beach by the Clean Beaches Coalition.